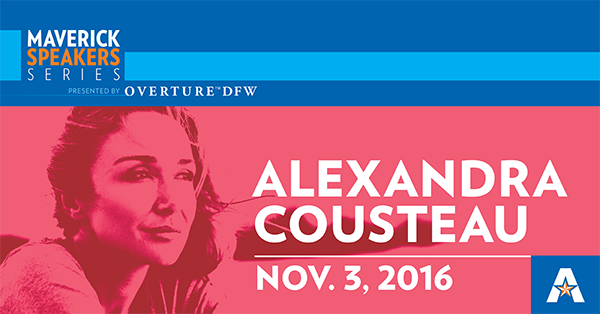 Environmental advocate Alexandra Cousteau will discuss "This Blue Planet: Preserving and Sustaining a Healthy Earth" at 7:30 p.m. Thursday, Nov. 3, in Texas Hall for the next Maverick Speakers Series event. A National Geographic “emerging explorer,” filmmaker, and globally recognized advocate on water issues, Cousteau continues the work of her renowned grandfather, Jacques-Yves Cousteau, and her father, Philippe Cousteau Sr. Her global initiatives seek to inspire and empower individuals to protect not only the ocean and its inhabitants, but also the human communities that rely on freshwater resources. The deadline to register and be eligible to vote in the Tuesday, Nov. 8, election is Tuesday, Oct. 11. Registration applications are online at votetexas.gov. Also register 8 a.m.-2 p.m. through Tuesday, Oct. 11, in Suite 129 of the Swift Center. See voter registration and election information, including sample ballots, at the Tarrant County Election Office website. 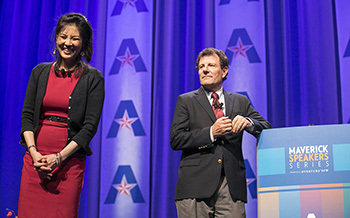 Pulitzer Prize winners Sheryl WuDunn and Nicholas Kristoff enjoyed a few laughs while speaking about human rights Thursday. The couple spoke to a journalism class and dined with VIP guests before the Maverick Speakers series event at Texas Hall. See more photos. Eight graduate programs invite you to give their classes a trial run and learn more about earning your master’s degree. Attend a class in a program that interests you in criminology/criminal justice, English, history, linguistics, modern languages, political science, and sociology. Register online. Speak with representative from 85 different law schools from across the country at the Regional Law School Fair noon-3 p.m. Tuesday, Oct. 18, at the Maverick Activities Center. Application fee waivers will be distributed during the fair. The McNair Scholars Program is recruiting sophomores, juniors, and seniors from underrepresented communities who are interested in pursuing graduate degrees. Attend the open house 11:30 a.m.-1 p.m. Wednesday, Oct. 12, in Room 202 of Ransom Hall. Applications are accepted through Thursday, Nov. 15. 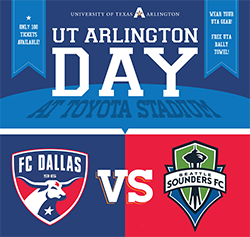 Wear your Maverick gear to UTA Day with FC Dallas 3:30-6 p.m. Sunday, Oct. 16, at Toyota Stadium in Frisco. The Dallas football club faces the Seattle Sounders. Transportation to and from the game and pre-game and on-field activities are planned. 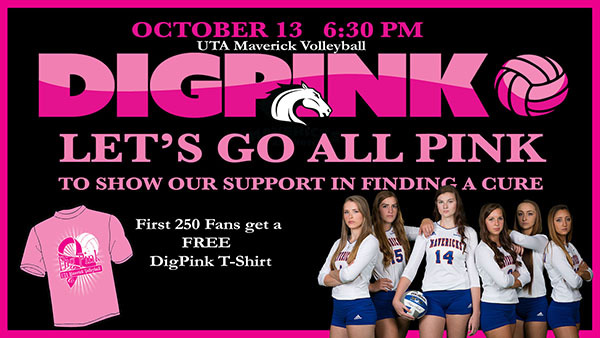 Receive a free UTA rally towel. Tickets are $15; act fast because there are only 100 available for students. The Parent and Family Center needs volunteers for Parent and Family Weekend Friday-Saturday, Oct. 21-22. Volunteer online. Student email accounts have a new filtering folder, Microsoft’s Clutter, which filters emails deemed low priority. To ensure students receive University-related messages, email addresses from uta.edu will not be filtered. Log in to your UTA email account, click Clutter in the left-hand menu, and select the Clutter settings option. Visit Office Outlook Support for more details. 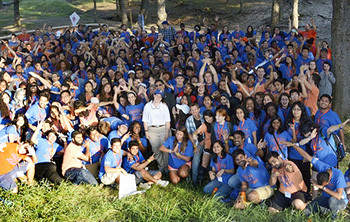 At the beginning of every academic year, the Fall Leadership Retreat offers students an intensive experience focused on leadership development and team building. READ MORE.